Accommodation » The Mission of the creators of Centro Emma is to provide tools and the environment for healing, expansion, harmony and bliss. Super comfortable, relaxing and rejuvenating. A spacious 16m2 double bedroom with an adjoining 9m2 full bathroom. Can be used as an adjoining suite with the Art Room. A/C and heater.Independent access. Max. capacity 3 persons in one double bed and one single. A 16m2 private room with independent access. Opens to an inner garden with a (real) lawn. Comfortable, spacious accommodation with a large 12m2 en-suite bathroom featuring a corner bathtub/shower, A/C and heater. Max. capacity 2 persons in two single beds that can also be made up as a double. A 20m2 wooden cabin with two single beds (can also be made up as a double). Independent access. Opens to an inner garden with a (real) lawn. Comfortable, spacious accommodation with en-suite bathroom with shower. Rustic with elegance. A 25m2 private studio with kitchen, situated in the central garden, double bed, en suite bathroom with shower, equipped kitchen, porch. A/C and heater.Opens to a twisty path with fruit trees and a gazebo. Max. Capacity 3 persons in one double bed plus single sofa-bed. Access to a wonderful pool area where guests can relax and suntan, very private and secluded. 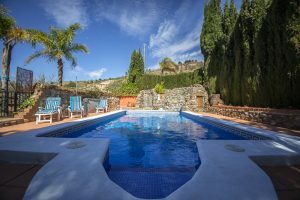 Villa Emma offers a wonderful restorative environment for anyone looking to get away from it all, to rejuvenate mind and body, connect with nature, while still being able to enjoy all the local area has to offer. We can design bespoke well-being programmes for guests, either for multiple days or arrange individual treatments and activities with specialists and therapists.